← Badge Modernization: A Sign of the Times? 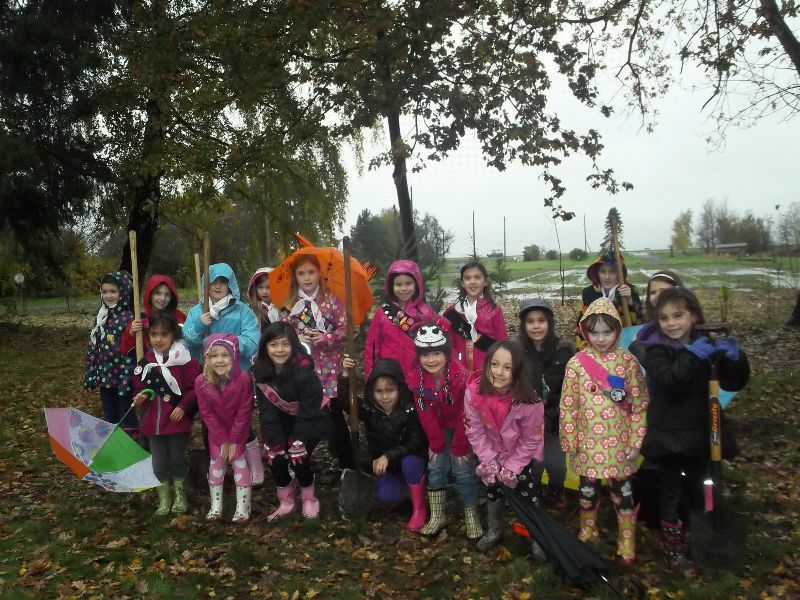 This year the 2nd Sparks and 5th Brownies of the Rivers End district in Richmond, B.C., took part in a very special service project for Remembrance Day. During my daughter’s first year in Sparks, her Unit was able to send a care package to a soldier named Darren Berg who was serving his country in Afghanistan. Darren was from Richmond and sent an email and photo to the girls of him sharing items from his care package with local children. We were lucky that Darren, who was home less than 48 hours at the time, came into the last Unit meeting of the year to meet and thank the girls in person. He patiently answered their questions, and posed for photos with them. Last year, he unfortunately passed away from a brain aneurism at the young age of 21. For Remembrance Day we thought it would be nice to plant a ‘giving tree’ in his honour. We contacted the City of Richmond with the idea and they graciously donated the tree, as well as the plot of land for it, so it could be shared by everyone. On a very rainy, windy and cold Saturday, 18 of our girls braved the weather to take part in our tree planting. We walked through the sharing farm together, some of the girls carrying shovels larger than themselves, and found our perfect plot of land for Darren’s tree. Each girl took turns digging the hole, and then filling it up again when we planted the fir tree. At the end we held a moment of silence for Darren. It seemed fitting that even after he had left this Earth, his memory was still living on and helping others as he did in life. Right now the tree is small, like many of the girls, but it will grow to be a lovely addition to the farm. In the summer it will provide shade on the hot days; in the winter it will be a shelter against the rain and cold. It will house birds, and owls and many other creatures. This Remembrance Day, it’s important to take a moment to think of those who have given their lives for the freedoms we enjoy. We remember those who are no longer with us and can make the world a better place in their stead. A single tree doesn’t seem like much right now, but if we planted one for each person who touched our lives the world would be a lot greener. By guest blogger and Guider Chantal Semple, of the 5th Brownies of the Rivers End district in Richmond, B.C. This entry was posted in Awesome Activities. Bookmark the permalink. What a wonderful story. Thank you for sharing!! !